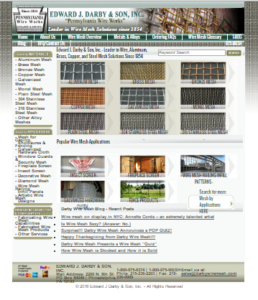 In July of 2016, Edward J. Darby & Son, Inc. – one of the country’s oldest manufacturers and distributors of wire mesh and wire cloth – launched a brand new website aimed to better serve all types of wire mesh users. Our old site – may it rest in peace – was great…for a while. We will miss it! Our new website contains a ton of more information, including new and up-to-date wire mesh specific content and high quality photos. We hope that you like it! Next Post: Next post: Philadelphia Welcomes the Democratic National Convention; Darby Wire Mesh is Ready!